Going out for dinner can be a bit like attending a magic show. You see the menu (the magician), you know some of the ingredients (the props), and what shows up on your table is a plate full of enchanting flavors (the mind-blowing illusion). How do so many inn chefs manage to astound and delight us? Many bed and breakfast inns allow guests to go “behind the curtain” into this mysterious world through cooking classes and demonstrations. Before you know it, you’ll be astonishing guests in your own home with the tips and techniques you learned while on a relaxing getaway. 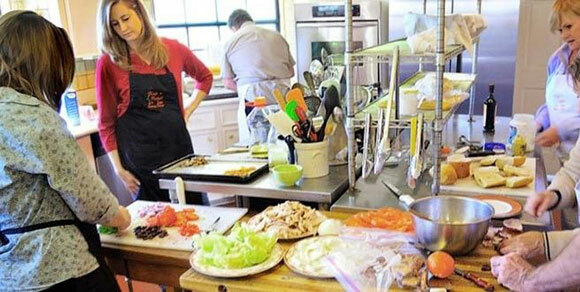 Blair House Inn in Wimberley, TX, boasts a leisure cooking school offering three-day themed cooking retreats. The school focuses on the “show, tell, do, review” method so that every student is a full participant in the creation of the meal. Accommodations at the inn include rooms in the main lodge, cottage suites, and completely private cottages with two-person whirlpool tubs. The 2017 class schedule has been released; sign up now to spend a Monday through Wednesday perfecting your classic French, BBQ camp, or taste of New Orleans techniques. The Lavender Inn in Ojai, CA, features public and private classes at the Ojai Culinary School. Visiting chefs and local artisanal cooks lead a variety of hands-on and demonstration classes. Current upcoming courses include a focus on vegan dishes and another showing the versatility of tomatoes. Host a unique team building experience with a private class based on the HGTV show Chopped. 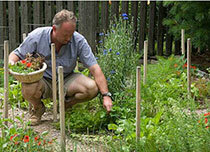 The inn also boasts a relaxing spa offering facials, massages, and garden yoga. Be a chef for the day in the one-on-one cooking experience at the Hartstone Inn in Camden, ME. Students work side-by-side with Chef Michael to create the evening’s meal; they can then brag about the experience every time they wear their Hartstone Inn apron. Prefer to learn with colleagues? The cooking school presents scheduled and private classes from November until May. The coastal inn features 400 live orchids in the common areas, 21 guest rooms in two historic buildings, and complimentary breakfast. Guest chefs spend two days at the Annville Inn in Annville, PA, with guests participating in the cooking class series. The chef and guests get acquainted over wine and cheese on the first evening. The following day, everyone gathers for a hands-on cooking experience. After a short break to freshen up, the chef and students are treated to the dinner of their creation. 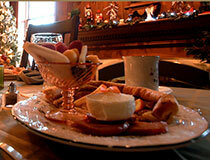 The package includes a candlelit gourmet breakfast each morning. The inn on three acres features a swimming pool, fish pond, eight-person hot tub, and a soundproof theater with tiered seating for watching movies. The Briar Patch Bed & Breakfast in Middleburg, VA, includes a Friday evening tasting of local wines in the cooking class weekends. The wines are then paired with the four-five course meal that guests help create on Saturday evening. Included in the demonstration is information on how to prep, pre-cook, and present the dishes. The pet-friendly inn on 47 acres boasts mountain views and easy access to horse, antique, and wine country. This sounds like a great gift idea for my husband. And two of the suggested inns aren’t too far away.